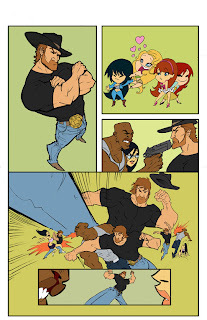 Peng-Peng Art: Chuck Norris doesn't sleep. He waits. Chuck Norris doesn't sleep. He waits. then this is a new commission i'm working on of someone's original character Tammy. i normally wouldn't draw her mouth smiling so big but she's got buckteeth and i felt it was necessary to show that. it's part of who she is, apparently. it's just an inked commission so i should be done with it soon. thanks so much to Gil Elvgren for his amazing girly pin-ups. i mean, practically any artwork u've ever seen of a pin-up girl from the 40s to the 70s he probably drew. unless it was Olivia. she's amazing too. what would i be without these greats! ?